Institute of Banking Personnel Selection (IBPS) has released official notification for Common Recruitment Process (CRP) for selection of personnel in Specialist Officers' cadre posts. Online examination for the selection will be held in December 2017/ January 2018. IBPS SO recruitment will be held for selecting candidates to the posts of I.T. Officer (Scale-I), Agricultural Field Officer (Scale I), Rajbhasha Adhikari (Scale I), Law Officer (Scale I), HR/ Personnel Officer (Scale I) and Marketing Officer (Scale I). The CRP involves common written examination (preliminary and main), common interview and provisional allotment. 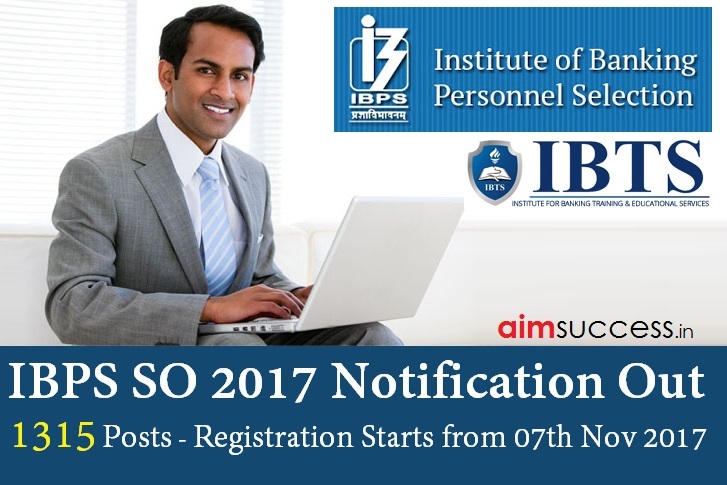 IBPS SO 2018 notification can be found at ibps.in. 20 organisations have participated in the IBPS SO CRP for selecting candidates against 1315 posts. Rajbhasha Adhikari (Scale I): Post Graduate Degree in Hindi with English as a subject at the degree (graduation) level OR Post graduate degree in Sanskrit with English and Hindi as subjects at the degree (graduation) level. Candidates must be in the age group of 20-30 years and must have obtained the qualifying degree from a recognized University/ institute. Other than IT Officer post, candidates should have Certificate/Diploma/ Degree in computer operations/ Language/ should have studied Computer / Information Technology as one of the subjects in the High School/ College/ Institute. How to apply for IBPS SO 2017? Step 2: Click on the CWE Specialist Officer tab. Step 3: In the new window, click on the apply link. Step 6: Complete the application form and make application fee payment.